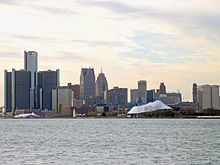 The Detroit Urban Area, which serves as the metropolitan area's core, ranks as the 11th most populous in the United States, with a population of 3,734,090 as of the 2010 census and an area of 1,337.16 square miles (3,463.2 km2). This urbanized area covers parts of the counties of Macomb, Oakland, and Wayne. These counties are sometimes referred to as the Detroit Tri-County Area and had a population of 3,862,888 as of the 2010 census with an area of 1,967.1 square miles (5,095 km2). The Office of Management and Budget (OMB), a federal agency of the United States, defines the Detroit–Warren–Dearborn Metropolitan Statistical Area (MSA) as the six counties of Lapeer, Livingston, Macomb, Oakland, St. Clair, and Wayne. As of the 2010 census, the MSA had a population of 4,296,250 with an area of 3,913 square miles (10,130 km2). The nine county area designated by the OMB as the Detroit–Warren–Ann Arbor Combined Statistical Area (CSA) includes the Detroit–Warren–Dearborn MSA and the three additional counties of Genesee, Monroe, and Washtenaw (which include the metropolitan areas of Flint, Monroe, and Ann Arbor, respectively). It had a population of 5,318,744 as of the 2010 census and covers an area of 5,814 square miles (15,060 km2). Lenawee County was removed from the CSA in 2000, but added back in 2013. Conan Smith, a businessperson quoted in a 2012 article by The Ann Arbor News, stated the most significant reason Washtenaw County, including Ann Arbor, is not often included in definitions of Metro Detroit is that there is a "lack of affinity that Washtenaw County as a whole has with Wayne County and Detroit or Oakland County and Macomb". Ann Arbor is nearly 43 miles by car from Downtown Detroit, and developed separately as a university city, with its own character. Smith said that county residents "just don't yet see ourselves as a natural part of that [Detroit] region, so I think it feels a little forced to a lot of people, and they're scared about it". Detroit and the surrounding region constitute a major center of commerce and global trade, most notably as home to America's 'Big Three' automobile companies: General Motors, Ford, and Chrysler. Detroit's six-county Metropolitan Statistical Area (MSA) has a population of about 4.3 million and a workforce of about 2.1 million. In December 2017, the Department of Labor reported metropolitan Detroit's unemployment rate at 4.2%. The Detroit MSA had a Gross Metropolitan Product (GMP) of $252.7 billion as of September 2017. Casino gaming plays an important economic role, with Detroit the largest US city to offer casino resort hotels. Caesars Windsor, Canada's largest, complements the MGM Grand Detroit, MotorCity Casino, and Greektown Casino in the city. The casino hotels contribute significant tax revenue along with thousands of jobs for residents. Gaming revenues have grown steadily, with Detroit ranked as the fifth-largest gambling market in the United States for 2007. When Casino Windsor is included, Detroit's gambling market ranks either third or fourth. Detroit automakers and local manufacturers have made significant restructurings in response to market competition. GM made its initial public offering (IPO) of stock in 2010, after bankruptcy, bailout, and restructuring by the federal government. Domestic automakers reported significant profits in 2010, interpreted by some analysts as the beginning of an industry rebound and an economic recovery for the Detroit area. The region's nine-county area, with its population of 5.3 million, has a workforce of about 2.6 million and about 247,000 businesses. Fourteen Fortune 500 companies are based in metropolitan Detroit. In April 2015, the metropolitan Detroit unemployment rate was 5.1 percent, a rate lower than the New York, Los Angeles, Chicago and Atlanta metropolitan areas. Michigan typically ranks second or third in overall Research & development (R&D) expenditures in the United States. Metro Detroit is an important source of engineering and high-tech job opportunities. As the home of the "Big Three" American automakers (General Motors, Ford, and Chrysler), it is the world's traditional automotive center and a key pillar of the U.S. economy. In the 2010s, the domestic auto industry accounts, directly and indirectly, for one of ten jobs in the United States, making it a significant component for economic recovery. Metro Detroit is a tourist destination that easily accommodates super-sized crowds to events such as the Woodward Dream Cruise, North American International Auto Show, the Windsor-Detroit International Freedom Festival, 2009 NCAA Final Four, and Super Bowl XL. The Detroit International Riverfront links the Renaissance Center to a series of venues, parks, restaurants, and hotels. In 2006, the four-day Motown Winter Blast drew a cold weather crowd of about 1.2 million people to Campus Martius Park area downtown. Detroit's metroparks include fresh water beaches, such as Metropolitan Beach, Kensington Beach, and Stony Creek Beach. Metro Detroit offers canoeing through the Huron-Clinton Metroparks. Sports enthusiasts and enjoy downhill and cross-county skiing at Alpine Valley Ski Resort, Mt. Brighton, Mt. Holly, and Pine Knob Ski Resort. The Detroit River International Wildlife Refuge is the only international wildlife preserve in North America that is located in the heart of a major metropolitan area. The Refuge includes islands, coastal wetlands, marshes, shoals, and waterfront lands along 48 miles (77 km) of the Detroit River and Western Lake Erie shoreline. The region's leading attraction is The Henry Ford, located in the Detroit suburb of Dearborn; it is America's largest indoor-outdoor museum complex. The recent renovation of the Renaissance Center, and related construction of a state-of-the-art cruise ship dock, new stadiums, and a new RiverWalk, have stimulated related private economic development. Nearby Windsor has a 19-year-old drinking age with a myriad of entertainment to complement Detroit's Greektown district. Some analysts believe that tourism planners have yet to tap the full economic power of the estimated 46 million people who live within a 300-mile (480-km) radius of Detroit. Today, the Detroit suburbs in Oakland County, Macomb County, and northeastern and northwestern Wayne County are predominantly ethnic European American. Oakland County is among the most affluent counties in the United States, with a population of more than one million. In Wayne County, the city of Dearborn has a large concentration of Arab Americans, mainly Shi'ite Muslim Lebanese, whose ancestors immigrated here in the early 20th century. Recently,[when?] the area has witnessed some growth in ethnic Albanian, Asian and Hispanic populations. In the 2000s, 115 of the 185 cities and townships in Metro Detroit were more than 95% white. African Americans have also moved to the suburbs: in 2000 44% of the more than 240,000 suburban blacks lived in Inkster, Pontiac, Oak Park, and Southfield. Bus service for the metropolitan area is provided jointly by the Detroit Department of Transportation (DDOT) and Suburban Mobility Authority for Regional Transportation (SMART) which operate under a cooperative service and fare agreement. The elevated Detroit People Mover encircles downtown providing service to numerous downtown hotels, offices and attractions. The Woodward Avenue Streetcar has recently began service to provide service between downtown and New Center, and the proposed SEMCOG Commuter Rail would extend from Detroit's New Center area to The Henry Ford, Dearborn, Detroit Metropolitan Airport, Ypsilanti, and Ann Arbor The Regional Transit Authority (RTA) was established in December 2012 to coordinate the services of all existing transit providers, and to develop a bus rapid transit service along Woodward Avenue. The Michigan International Speedway in Brooklyn hosts various Auto racing: NASCAR, INDYCAR, and ARCA. The Detroit River hosts Hydroplane racing held by the APBA for the Detroit APBA Gold Cup. ^ "Revised Delineations of Metropolitan Statistical Areas, Micropolitan Statistical Areas, and Combined Statistical Areas, and Guidance on Uses of the Delineations of These Areas" (PDF). OMB BULLETIN NO. 13-01. Executive Office of the President, Office of Management and Budget. Archived from the original (PDF) on 19 March 2013. Retrieved 4 April 2014. ^ a b Stanton, Ryan J. "Conan Smith: Why Ann Arbor doesn't see itself as part of Metro Detroit - and why it should," The Ann Arbor News. 30 May 2012. Retrieved on November 9, 2013. ^ "Local Area Unemployment Statistics". Local Area Unemployment Statistics. Bureau of Labor & Statistics. Retrieved February 13, 2018. ^ "Total Gross Domestic Product for Detroit-Warren-Dearborn, MI (MSA)". Federal Reserve Bank of St. Louis. Retrieved February 14, 2018. ^ Detroit Regional Chamber (2006) "Detroit/Windsor Border Update: Part I-Detroit River International Crossing Study". Archived from the original on May 6, 2008. Retrieved 2007-03-14. Retrieved on April 8, 2007. ^ "FAQS – City of Detroit | www.detroitmi.gov". Retrieved May 3, 2010. ^ Regional Profile Archived 2007-02-03 at the Wayback Machine Detroit Regional Chamber. Retrieved on June 17, 2009. ^ MEDC (2009).Michigan: High Technology Focus, State of Michigan. Retrieved on June 17, 2009. ^ MEDC,(2009).Michigan Advantage Archived 2009-03-21 at the Wayback Machine State of Michigan. Retrieved on June 17, 2009. ^ Mark Arend (January 2012). "Where the high tech jobs are", Site Selection magazine. ^ "SAE World Congress convenes in Detroit". Retrieved December 26, 2008. ^ Lawrence, Peter (2009).Interview with Michigan's Governor Archived 2008-11-20 at the Wayback Machine, Corporate Design Foundation. Retrieved on May 2, 2009. "Michigan is known as the world's automotive center." ^ Cwiek, Sarah (November 30, 2010). "New study shows strong economic recovery in Metro Detroit". NPR Michigan. Retrieved December 4, 2010. ^ Eisenstein, Paul A. (April 2012). "Assessment of tax revenue generated by the auto industry" (PDF). Center for Automotive research. Archived from the original (PDF) on November 8, 2012. Retrieved December 2, 2012. ^ Regional Advantages for International Business Archived 2007-09-25 at the Wayback Machine. World Trade Center Detroit Windsor. Retrieved on September 3, 2007. ^ "Annual Report on Research, Scholarship and Creative Activity at the University of Michigan FY2006" (PDF). UM Research. January 18, 2007. Archived from the original (PDF) on 2007-09-25. Retrieved 2007-11-14. ^ The Urban Markets Initiative, Brookings Institution Metropolitan Policy Program The Social Compact, Inc. University of Michigan Graduate Real Estate Program (October 2006).Downtown Detroit In Focus: A Profile of Market Opportunity Archived 2011-09-18 at the Wayback Machine. Downtown Detroit Partnership. Retrieved on July 14, 2010. ^ "Detroit: Economy Major Industries and Commercial Activity". Advameg, Inc. Retrieved 2008-06-12. ^ "Metropolitan and Micropolitan Statistical Area Totals Dataset: Population and Estimated Components of Change: April 1, 2010 to July 1, 2018" (CSV). 2018 Population Estimates. United States Census Bureau, Population Division. April 18, 2018. Retrieved April 18, 2019. ^ "Annual Estimates of the Population of Metropolitan and Micropolitan Statistical Areas: April 1, 2000 to July 1, 2007". US Census Bureau. Retrieved September 9, 2008. ^ "Annual Estimates of the Population of Combined Statistical Areas: April 1, 2000 to July 1, 2007". US Census Bureau. Retrieved 2008-04-07. ^ "Metro Area Factsheet: Detroit-Ann Arbor-Flint, Michigan CMSA". Federation for Immigration Reform. Archived from the original on June 11, 2010. Retrieved February 10, 2013. ^ a b Baulch, Vivian M. (September 4, 1999). Michigan's greatest treasure -- Its people Archived 2007-07-31 at Archive.today. Michigan History, The Detroit News. Retrieved on April 4, 2009. ^ "2004–05 Community profile Oakland County" (PDF). Archived from the original (PDF) on 9 July 2007. Retrieved 11 July 2007. Oakland County also ranks as the fourth wealthiest county in the nation among counties with populations of more than one million people. "Historic Light Station Information and Photography: Michigan". United States Coast Guard Historian's Office.